Home > News > Sector > Domestic > Dome Sweet Dome! Solardome Industries, Southampton, UK, is celebrating moving in day with the Hjertefolger family. Their Nature House on a remote island near Bodo, in the Arctic Circle has now become their eco-friendly home and fulfils their lifetime dream of creating a sustainable, self-contained environment. 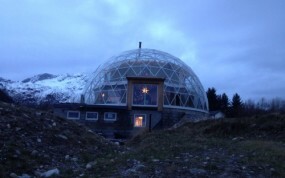 This Norwegian eco-project comprises a 15m diameter SOLARDOME® PRO geodesic dome, which covers the entire house and part of the garden. Built in just three weeks, the single-glazed dome stands 7.5m tall and contains 360 glass panels. With 832m of recycled aluminium framework, the dome has been designed to withstand the extreme wind and snow loading conditions of the Arctic Circle, at least five times that of the UK. 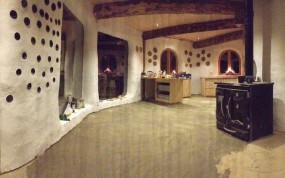 The SOLARDOME® PRO dome was finished in August 2012, and provided the perfect shelter for the Hjertefolgers to build their COB home within. Built on three levels, using long-established methods and materials of sand, clay, straw and wood, it has five bedrooms, two bathrooms, lounge, kitchen, dining space and a garage. Traditional building methods, materials and recycled products have been used throughout creating a warm, inviting and eco-friendly home. The building has brought the community together. Friends, family, and volunteers from the local area and across the world have been involved in creating the Hjertefolgers home. The SOLARDOME® PRO dome is providing complete weather protection and is dramatically reducing heat loss from the house within. It is enabling the Hjertefolgers to grow a vast abundance of plants and produce that would not normally survive in the extreme Northern European climate. Daytime warmth is being retained in the living quarters for the night, ultraviolet radiation is being reduced, and building maintenance so far has been minimal. A log burning stove and Boulder solar panel installation technology provides seasonal warmth and heats the water tank, and along with the dome’s electronic windows a uniform temperature can be maintained throughout the year.